Fellowship Hall / 9:45 a.m. / Each Sunday in May, forums will focus on a study of “Plain Living: A Quaker Path to Simplicity” by Catherine Whitmire. We encourage participants to read ahead and share what the chapters meant for them. Karin has purchased several copies of the book, or they can be ordered or purchased from other booksellers. According to the Amazon description, “this book focuses on and provides direction to the gimmick-free spiritual path followed by Quakers. 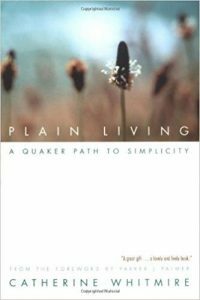 For over three centuries Quakers have been living out of a spiritual center in a way of life they call ‘plain living’.” Their accumulated experiences and distilled wisdom have much to offer anyone seeking greater simplicity today. The book is made up of quotes from Quakers from George Fox to Frank Levering, Wanda Urbanska, and others. Catherine Whitmire challenges us with thoughtful queries at the end of each chapter, which we hope will lead to stimulating discussion.